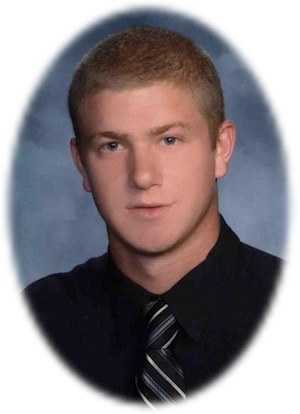 Obituary – Sullivan, Denton Darrell « Perry High School Alumni Association, Inc.
Denton Darrell Sullivan, 19, of Perry, Oklahoma was born to Brian Lane and Shana Paulette Becker Sullivan. He was born June 15, 1989 in Stillwater, Oklahoma and died Tuesday, June 24, 2008 west of Perry. Denton was a 2008 graduate of Perry High School. He enjoyed fishing, playing basketball and baseball, hanging out with his friends and family, giving his Me Me a hard time and spending time with his Pa Pa. He loved his dog, camping and inner-tubing. Funeral services will be at 2:00 p.m. Monday, June 30, 2008 at the First Baptist Church in Perry. Brother Aaron Summers will officiate. Interment will be in Grace Hill Cemetery at Perry. Services are under the direction of Brown-Dugger Funeral Home of Perry. The family will receive friends from 6:00-8:00 p.m. Saturday, June 28, 2008 at Brown-Dugger Funeral Home. Memorials may be made to the Perry Diamond Club in care of Brown-Dugger Funeral Home, 1010 N. 7th Street, Perry, Oklahoma 73077. Denton is survived by his parents, Shana and Troy Hogan of Perry, Oklahoma and Brian Sullivan of Edmond, Oklahoma; two sisters, Candice Hogan of Geary, Oklahoma and Ashley Sanders of Perry, Oklahoma; one brother, Jordan Nida of Perry, Oklahoma; maternal grandparents, Judy and Richard Conley of Davenport, Oklahoma; paternal grandparents, Zelma Sullivan and Joe and Jean Hogan, all of Perry, Oklahoma; six aunts, Darala Lewis, Nancy Frazier and her husband, Ron, Elizabeth Lowry and her husband, Robert, Cindy Boone and her husband, John, and Sherry Wilde and her husband, Kevin, all of Perry, Oklahoma and Patricia Roberson of Moore, Oklahoma; one uncle, Terry Hogan and his wife, Johnnie Kay, of Perry, Oklahoma; a special cousin, Logan Lewis of Perry, Oklahoma; and ten great-uncles and great-aunts, Jim Becker and his wife, Reta, Sharon Heppler and her husband, Butch, and Virgil Biggs and his wife, Janis, all of Perry, Oklahoma, Patti Slaughter of Colonial Heights, Virginia, Phyllis Haskin, of Cushing, Oklahoma and Mary Overbay and her husband, Bill, of Enid, Oklahoma. He was preceded in death by his maternal grandfather, Jack Becker; paternal grandfather, Robert Sullivan; and one cousin, Dillon M. Forman.